Why you'll never choose colors without a consultant ever again! I was talking to a fellow contractor friend of mine not too long ago and they told me, "man, our clients could have really used your services". He told me how the customer bought $800 worth of a single paint color and his team got the entire first coat of the project complete (around $2,000 in labor) when the client came in and burst into tears because she hated the color. There is your reason. Need I say more? We often think of home decorating starting in a some airy interior design office. There's a mood board on the wall and books stacked neatly with a terrarium on top. Perhaps a display or two of personal artifacts acquired during world travels. An actual scene or not, one thing is for sure: a trip to the paint store is still a must. Ah, the dizzying, inspiring, and—let's just take a moment to tip our hats to the merchandiser who set this up—impeccably organized paint sample display. The short answer is sometime around the Industrial Revolution. The long answer, which I found here, is certainly worth the read. (Did you know there was, effectively, underground paint mixing? Me either.) New, efficient systems of manufacture, along with advances in the chemical formulations of paint, dovetailed with a growing rail industry in America. Put simply, more paint could go more places. A growing middle class had access to a product which allowed them to have their own slice of luxury: a home that was not merely functional, but stylish—even enviable—as well. Paint companies began investing in the potential of this emerging market by developing new methods of promotion. The advertisements below date from the 1880's. What I especially love is how they glued on actual samples of paint. Restrictions in technology (mass-produced color printing had a ways to go at this point) ultimately resulted in a very real, physical presence (rather than an image) of the paint in the consumer's home via "color chip cards." I like to imagine that, not unlike us, those 19th century home-owners held teeny-tiny examples of paint up to the wall, attempting to envision it covering the entire surface. And, not unlike us, I imagine they struggled a bit as well. Check out Architect Magazine's article, A Colorful History of Paint, for even more information and images. They also have a link to this veritable treasure trove of historical home decorating and improvement books. Another thing I noticed about the early paint samples is the color names. 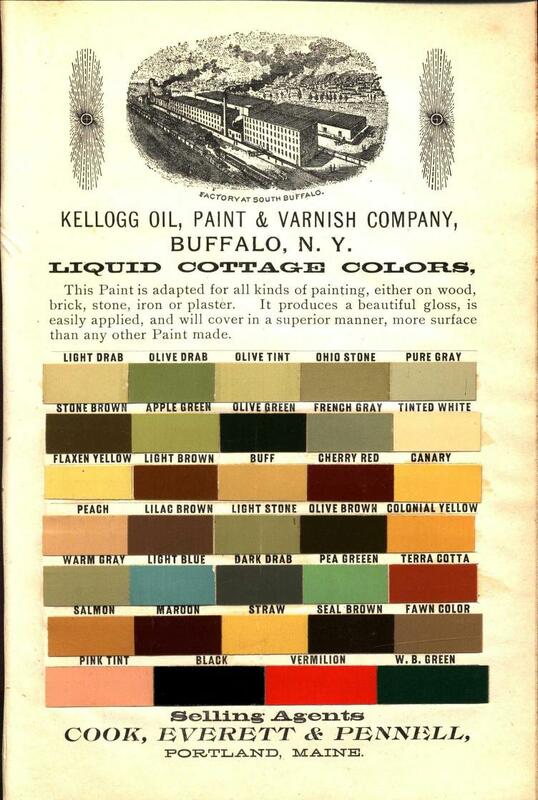 Apple Green, Pink Tint, Flaxen Yellow: The 19th century names are distinctly descriptive, definitely a far cry from more, um, poetic, names used by contemporary paint companies. Today, our homes are more than reflections of class; our personal spaces communicate who we are as people—our personalities, preferences, and histories. In addition, we consider these rooms as intimate enclosures. Mood and ambience are no longer decorative by-products; They are structural and functional in the most definitive sense. For a sensitive, and perhaps transformative, meditation on our collective notions of home, Gaston Bachelard's The Poetics of Space is a great read. And for a lighthearted take on paint color names, check out this Reddit thread. So now you know: A paint card is much more than its name. Beneath its seemingly disposable purpose it is actually something of a relic, a modern-day descendent of the complex—and ultimately, deeply human—desire to carve out a piece of the world that is truly ours. Do you find yourself gravitating towards a particular palette when decorating your own home? What do you want these colors to say about you? If you ever want to discuss these questions further as you undertake the task of re-doing your own home, drop us a line. Color consultation is one of our passions! We know what it's like to stand in front of the wall of endless color at the paint store and feel overwhelmed by all of the choices! There are few things more disappointing than spending time picking paint colors only to discover - after painting - that the color you chose isn't quite right. With our color consultations, we aim to take all the hassle out of choosing the perfect colors for your home. When I was in college I took an acting class as one of my electives. I did a little bit of theater in high school. I infamously played the Cowardly Lion in the Wizard of Oz which drew a standing ovation upon entrance. So for me, an acting class was a chance to hone in on those acting skills and relive my glory days. For our final project we were assigned a three man scene from a play about a character who buys a very expensive painting that is painted in no other colors but white with subtle textural variation. The other two characters were his friends, one of which who thought that the painting and the price were ridiculous and the other (me) who was open to the idea but mostly just supportive of the idea that one should be able to buy whatever they want or what they are moved by. I ended up painting a prop painting for the scene and later hung it up in my bathroom. I have to say the more time I spent with my white painting as bathroom wall art, the more I began to appreciate the color. I have had clients on both sides of the coin. Some who crave the life of a colorful room and detest the plainness, while others love the clean, open, elegance that white provides; not to mention its versatility. I say white is versatle because it is the supernal neutral. In a way it gives itself no impression. It hardly detracts from the colors it accentuates and yet there are SO many options. 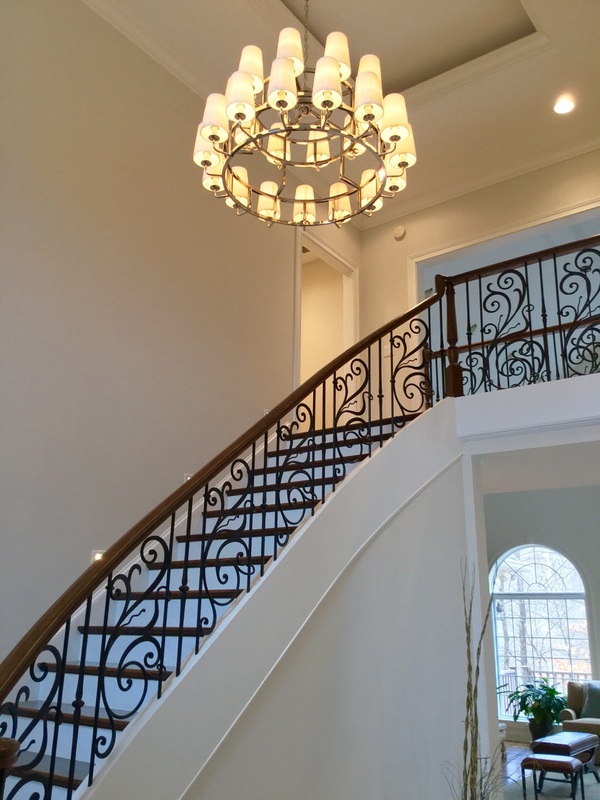 When selecting the proper white for your home the most important consideration is lighting. Lighting changes not only from room to room but from wall to wall. And as such, what is the best option for one room may not be the best for another room. That's why it's imperative to take your color sample into other rooms to make sure it has the same qualities you loved in the previous room. Or you may need to adjust the color a little to suit the lighting effects of each room. 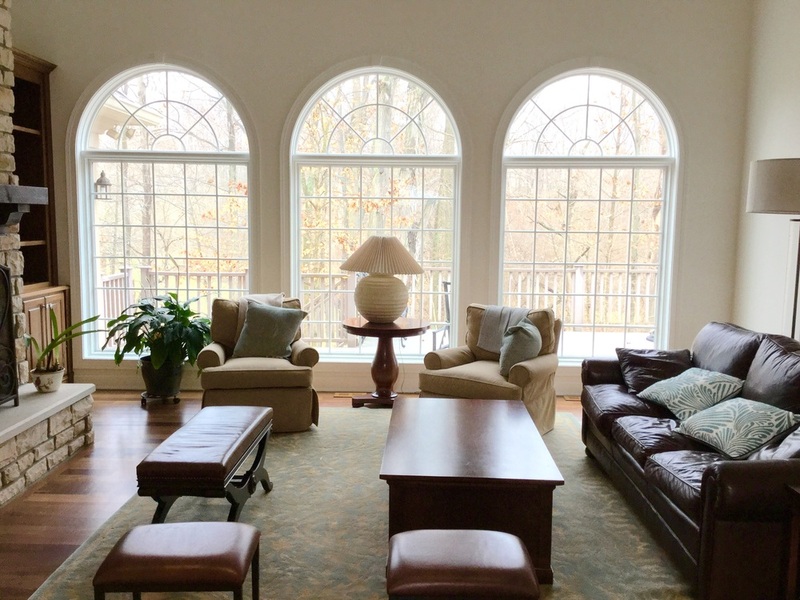 We had this very design challenge in this beautiful Renwick home in Bloomington, IN. The large open windows and vaulted ceilings provides tons of natural light into the space and the subtle off-white palette keeps the openness alive. The color here is Glacier White OC-37, a bit of a misnomer to this warmer in temperature hue. A breakfast dinnette with near floor to ceiling windows lets the sun light in and wakes you up to yet another wonderful day. The light from the dinnette travels through the kitchen all the way to the formal dining room. 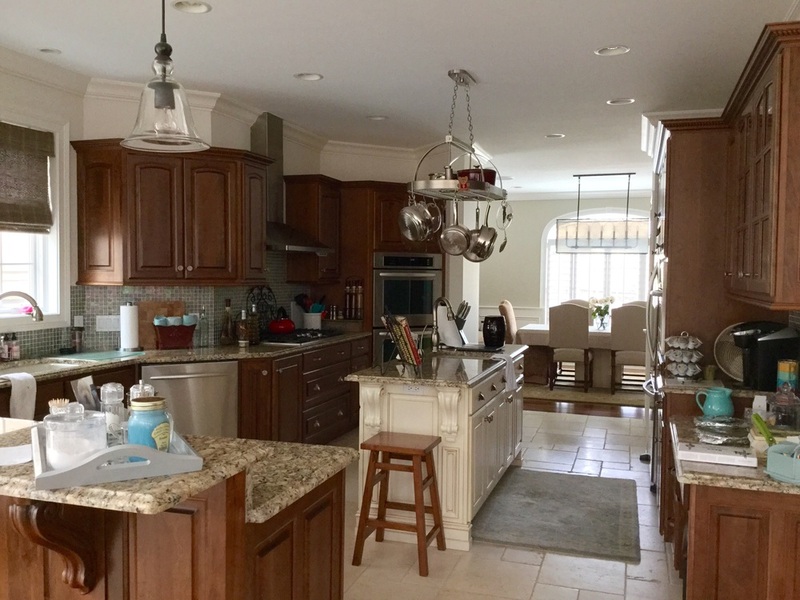 The earth tone granite countertops and rich wood cabinetry promote calmness and peace when trimed with soft white walls and trim. The cream island connects the walls together makIng this white more intentional than default. The eye is drawn to pops of blue ceramics. Keeping with the neutral scheme, the formal dining room was painted in a light grey called Greenwich Gate CSP-170. Being on the north west entrance with the sun setting in the view is the perfect place for an evening dining room with more open windows. Greenwich Gate is a warm-toned grey. The warmth turns the formal feel into a cozy formal. You don't feel like you can't touch anything or crack a joke. It's elegant but it's not cold. I feel like a young couple could announce their engagement to family here. Now comes the grand entrance. Everything about this entrance is grand. However, comparitively, the window only allows for a limited amount of light. This changes things. We can't just use glacier white in here and expect it to do the same as in the well lit rooms. The color here is Winds Breath OC-24. The goal here wasn't to match the glacier white but rather to find an appropriate white for the space. The lighting of this room, with less natural light and more warm lighting caused the glacier white to take on a green tint. However, Winds Breath maintains the warms while keeping the room light. Which was the primary goal. Lightness. 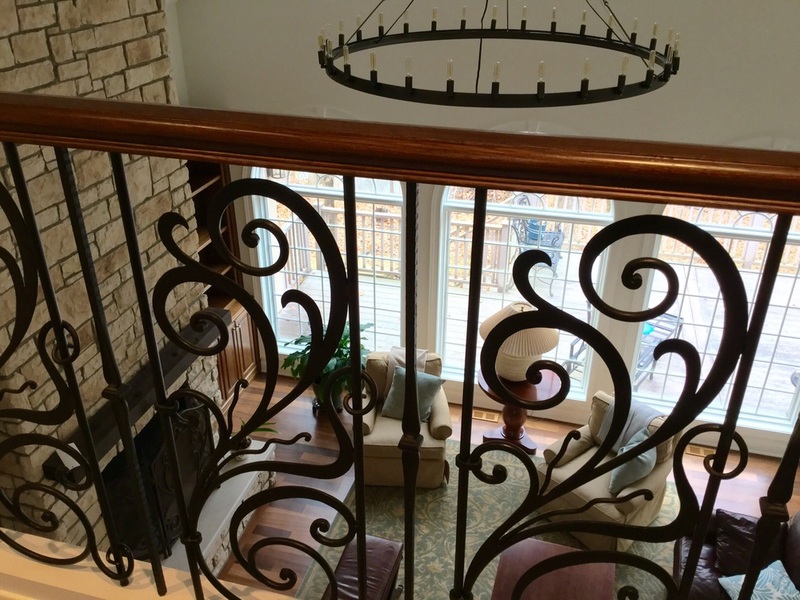 Up the stairs we can see into the living room with this stunning chandelier and intricate railing. Again in the bathrooms we chose different shades of white to account for the change in lighting. In this half bath we used Stoneware CSP-245. All of these colors can be found in Benjamin Moore fan decks. And below we have a Jack and Jill bathroom with entrances coming from two guest bedrooms painted in Ice Fog CSP-575. Finally in the grandkids' bedroom we've brought back Glacier White in keeping with this simple but elegant neutral white palette. To Get an Estimate for painting your home white call 812-668-2113 or connect with a consultant online now! Although we’ve had a warm and toasty Fall, cold weather is on its way, like it or not, and it’s time to get your home ready for Old Man Winter's annual visit. So grab a mug of hot chocolate and check out these cool tips for keeping your house warm and cheery in the months ahead. Home improvements are an excellent way to boost your home’s value, but which ones should you invest in? Here five great ways to increase the value of your home and your investment. If you’re just moving to Bloomington and trying to get your new house in order, you’re probably feeling the overwhelm pretty hard. Packing up your old stuff was probably hard enough and chances are everyone in your home got to the point where they’re just shoveling stuff in boxes to get it done. Now in your new home, you’re dealing with the consequences. Here are three things you can put on your must list to get a handle on moving in. This 4400 sq ft vacation home is a beautiful example of new prairie school design and is overflowing with amenities. The Color Theory team was privileged to work on this awesome cabin rental in Nashville, Indiana. I see a lot of clients who struggle to figure out how to arrange their bedroom. Where does the bed go? What do I do with this extra space over here? Where should the accent or statement wall be? I recently came across an article that uses Feng Shui principles to get the most out of your room. Our paint work featured in Houzz! At a Craftsmanship Conference through the PDCA I attended recently, we were priveleged to tour Frank Lloyd Wright’s first home. As a group of craftsmen it was hard to temper our trained eyes and not scrutinize every little fault created by the age of an historic home but overall we were very impressed by the detail and craft put into the home. I made sure to document the trip and use the original colors of Wright’s home as timeless inspiration. I titled this post the same title of the first chapter of Interaction of Color. More out of self-indulgence than public education am I using this platform to remark on Albers's seminal work. And perhaps as I read through the book again I will, from time to time, digest the chapters that I think will prove both relevant and interesting to those interested in color for their home or in art or in general. But I don't think I'll hold myself to it, just in an effort to keep things organic. The first thing you need to know about color recollection is that there is no use even trying. Our memory of color is terrible. If I were to tell any number of people to think of the color coca-cola red they would all readily imagine the color. However, each hue of red would be most likely distinguishably different from one imagination to the next. This is the example Albers uses to convince us that we are incapable of perfectly remembering a specific color. It would be nice if, like our auditory memory of picking up a tune and getting it lodged firmly in our minds all day long, that we could do this with color; it would make picking out curtains easier. But instead, it would be wiser to have the sample handy when decorating. The secondary problem in retaining color is that the categories and classes are both too broad and too narrow. "Though there are innumerable colors —shades and tones— in daily vocabulary, there are only about 30 color names", Albers says. (Albers, I) "Bride to Be" and "Crocodile Tears" hardly describe or evoke any thought of a particular shade of white or green and do more to increase the subjectivity and confusion than do they clarify. Their use case is that they make matching to a computerized code and formula more or less easy to retreve and remember. Case in point, "bride to be" and "crocodile tears" were two of the earliest colors I painted in my career. To one in which the home owner exclaimed, "I don't care if it looks pink! It looks good!" Who comes up with these color names? A question I get asked, every time I say the name of a paint color outloud. Nomenclature could be the culprit. The Hembe tribe in Southern Africa sees color differently than western cultures according to a BBC Horizon expose entitled "Do You See What I See?". In the clip there is a computerized clip where we see green squares arranged in a circle. The circle pattern on the right shows a clearly discernible blue square amidst the green squares. However, in the test the Hembe people had a very difficult time identifying which was the out-of-place square. Conversely, on the left, there is also an out-of-place square. Can you tell which? The Hembe people can. In fact they can tell outlier as readily and as easily as you or I can identify the blue square on the right. The theory is that the language of the Hembe people classify this type of blue as the same name given to the other green squares. And because they have always given them the same name and are not distinguished, they cannot notice the difference. However, the same theory is to be applied to the circle on the left with us. There is a quality in one of the squares on the left that our language apparently does not distinguish. Interesting, but why is this important? To go back to Albers's point, we must first "recognize that color deceives us continually." Just for a moment, look at the color of two adjacent walls in your home. Perhaps one where the daylight is casting it's shine and the other is in shade. They are the same paint and therefor the same color, but in this moment, are the two colors the same? No they are not. Lighting is the primary driver of color perception. Change the light source and you will perceive the color differently. I've noticed this in homes where there are older bulbs and newer bulbs. You may be switching to florecent which produce a white light but still have several incandecent lights which cast more of a yellow or orange hue. Even if your paint color is the same the two different lights may cause your one color to clash with itself. Or perhaps you are trying an accent wall by going just one step up on the color swatch. The result could be the appearance of one wall in shade and the other in light totally nullifying your accent wall. Are you getting nervous about the color you picked because your painters have only gotten through painting the borders around the room and it doesn't look like it did on the swatch? Be patient, your old color is literally influencing the appearance of the new color. 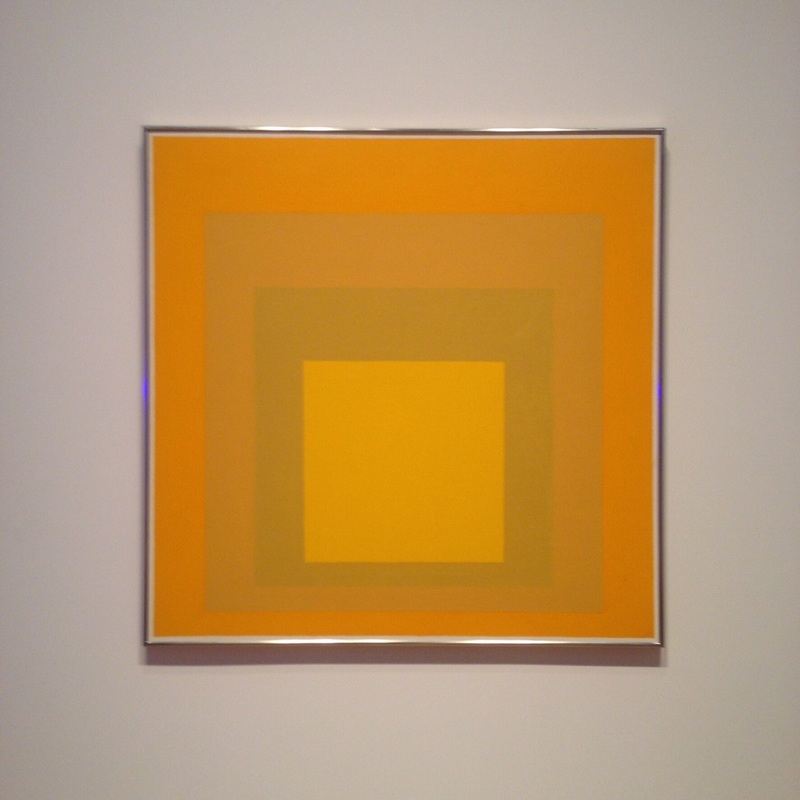 What we'll learn in Albers's book is that colors interacting with each other influence heavily the way they are perceived. And with practice or with the help of a Color Theory color consultant you can pick colors with confidence understanding how they will reacted with one another.